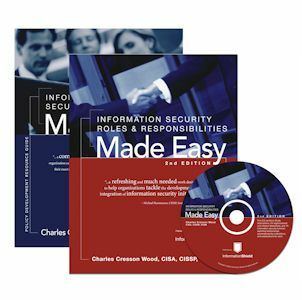 Information Security Roles and Responsibilities Made Easy by security expert Charles Cresson Wood, provides over 70 pre-written information security job descriptions, mission statements, and organization charts that you can easily customize for your own organization. Distributed via secure download. Does NOT include a book or CD. The many aspects of setting up a security function program in an organization can be hard to understand, let alone perform. Charles Cresson Wood’s latest book, …aims to help organizations through the issues. Though written largely with a North American audience in mind, the book includes many standard practices, which have been effective worldwide. In conclusion, although this book may not portray anything radically new, it brings the various information on IS under one roof. With the inclusion of the… publication license it is more than just a source of good reference material, it is an excellent resource designed to be easily adapted to an organization’s needs. Charles Cresson Wood, CISSP, CISM, CISA is an author, researcher, and management consultant based in Mendocino, California. In the information security field on a full-time basis since 1979, he has worked as an information security management consultant at SRI International (formerly Stanford Research Institute), as well as lead network security consultant at Bank of America. He has done information security work with over 120 organizations, many of them Fortune 500 companies, including a significant number of financial institutions and high-tech companies. His consulting work has taken him to over twenty different countries around the world. He is noted for his ability to integrate competing objectives (like ease-of-use, speed, flexibility and security) in customized and practical compromises that are acceptable to all parties involved. 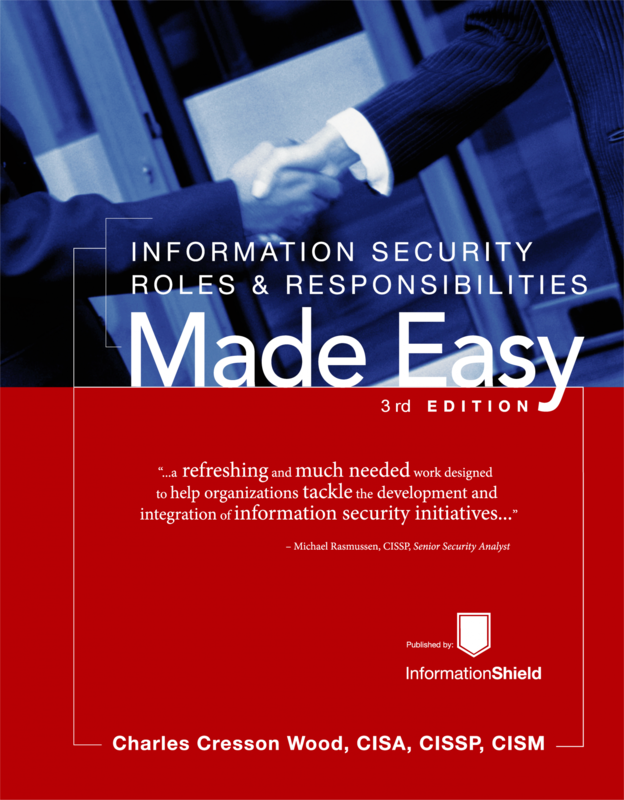 Acknowledging that information security is multi-disciplinary, multi-departmental, and often multi-organizational, he is additionally noted for his ability to synthesize a large number of complex considerations and then to document these in information security architectures, information security requirement statements, risk assessments, project plans, policy statements, and other clear and action-oriented documents. He has published over 375 technical articles and six books in the information security field. In addition to various TV and radio appearances, he has been quoted as an expert in publications such as Business Week, Christian Science Monitor, Computerworld, IEEE Spectrum, Infoworld, LA Times, Network Computing, Network World, PC Week, The Wall Street Journal, and Time. He has also presented cutting-edge information security ideas at over 100 technical and professional conferences around the globe. For over 10 years, Mr. Wood was a Senior North American Editor for the Elsevier academic research journal called “Computers &Security” and the practitioner’s newsletter entitled “Computer Fraud & Security Bulletin.” For over 17 years, for the Computer Security Institute, he wrote a monthly column about information security policies for the newsletter entitled “Computer Security Alert.” He as also been an information security strategy columnist for the global technology media company called TechTarget. He holds an MBA in financial information systems, an MSE in computer science, and a BSE in accounting from the Wharton School of Business at the University of Pennsylvania. He has also passed the Certified Public Accountant (CPA) examination. He is a Certified Information Security Manager (CISM), a Certified Information Systems Auditor (CISA), and a Certified Information Systems Security Professional (CISSP). In November 1996 he received the Lifetime Achievement Award from the Computer Security Institute for his “sincere dedication to the computer security profession.” Mr Wood is currently attending St. Francis School of Law, on a part-time basis, and when he graduates and passes the California bar exam, he intends to specialize in intellectual property protection and privacy matters. Policy: All Company X information security documentation including, but not limited to, policies, standards, and procedures, must be classified as “Internal Use Only,” unless expressly created for external business processes or partners. This policy prevents workers from disclosing to outsiders the specifics of how Company X secures its information and systems. These details could be used to compromise Company X information and systems. For example, knowledge about an internal process may help an industrial spy commit credible social engineering fraud. Because some information security policies are made public (for example on a web page), some workers may get the impression that other information security policies may be publicly released without adverse consequence. Information security policies should be revealed to outsiders only when it is required for business reasons, legal requirements, or because it is the ethical thing to do. Not all of the information security policies need to be released in these instances, and a summary statement is not only advisable but is appreciated by the recipients. Each information security policy document should be marked with an appropriate classification in order to communicate whether or not the policies are public information. Policy: Company X must specify and document a formal methodology for performing risk assessments. The specification must include, at a minimum, the risk methodology (quantitative or qualitative) used, specific criteria for ranking assets, sources of vulnerability and threat data, and acceptable risk thresholds. Commentary: This policy ensures that Company X uses a consistent, documented methodology for performing system risk assessments. By their very nature, risk assessments can be very subjective. By providing documentation of the risk methodology used, the organization can provide some level of consistency between different organizational units or teams performing risk assessments. One example of such a methodology is the Facilitated Risk Assessment (FRA). This process, which utilizes a qualitative risk analysis, is geared to a specific application, system or network. It allows risks to be addressed in financial and non-financial terms, as well as taking into consideration secondary impacts. It is a formal methodology that is driven by the system’s owners, conducted by a facilitator, and can be completed in a relatively short period of time. Policy: All Company X employees and contractors must review and acknowledge acceptance of the information security policies which apply to them at least on an annual basis. One of the key controls in any information security program is the education and training of users on both generic information security principles and specific company policies. This policy requires each user within the organization to read each set of security policies which applies to them, and sign an agreement to acknowledge that they have read and agree to abide by these policies. This policy has been in practice for many years in some organizations, without being formally documented. While many organizations require a user to sign an agreement to abide by policies when they first join the company, many times this form ends up in a personnel file never to be seen again. This policy is not only required by many security-related laws, it is critical documentation for any potential lawsuit involving employee violations of policy. While this seems like a large administrative burden, automated security policy tools that automate much of this process are now available.